Maine Governor Paul LePage’s proposal to drop 65,000 needy Mainers from MaineCare, Maine’s Medicaid program, to close a supposed budget deficit has even seasoned legislators looking hard at which programs to trim and which belts can be tightened, even more than they have already been over the past decade. After granting roughly 600 of Maine’s wealthiest a tax cut that totals about $122 million over the next few years, it is hard to understand what exactly the Governor has in mind. 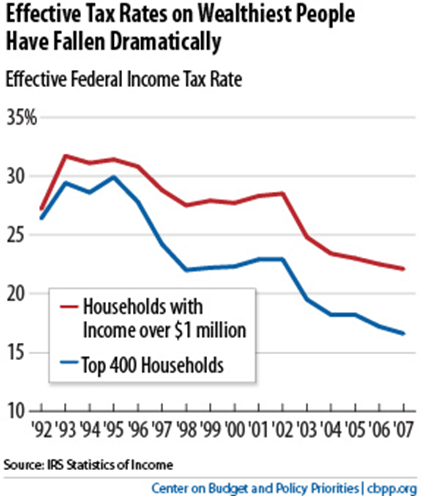 It certainly isn’t raising revenues from the most likely source of revenue that even Congress is contemplating at the Federal level… taxes on the wealthiest, who currently enjoy the lowest tax rates they have enjoyed in decades (see below). But here in Maine, even the Governor’s own staff at the Maine Revenue Services* agrees, making the tax code in Maine fairer would alleviate the budget “crisis.” As Representative Seth Berry puts it: “simply requiring the wealthiest 1% to pay the average effective state and local rate would balance the budget.” He goes on to say that if federal tax offsets were included the revenue generated would cover the budget shortfall and protect those MaineCare recipients the Governor is threatening to close schools over if the budget funding their care is not slashed. Read Rep. Berry’s entire post here on his blog, BerryBlog. *”According to MRS, Maine’s wealthiest 1% now pays an average effective state and local tax rate that is 14% lower than the statewide average. Accounting for federal offsets, the gap grows to 22%. The wealthiest 1% includes only 6700 tax filers, each making an annual average of $750,786 AGI.